At least.... It will be an acceptable tradeoff. Stereo system still has about 40% of the work left before I can play some tunes, but I I need some kind of heat-resistant material to stuff behind the tweeters, some speaker wire to extend the drivers side speaker and tweeter to the amp, and a soldering iron to get everything connected properly (crimped connectors). 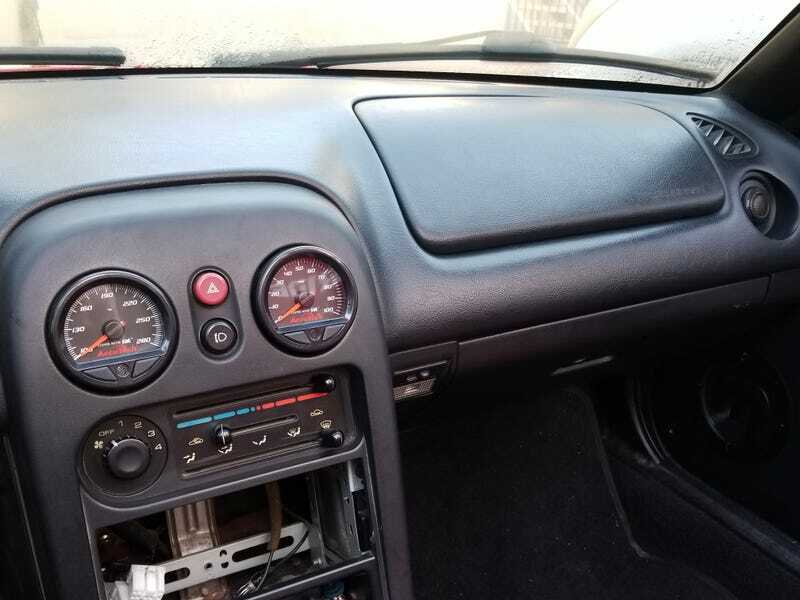 Oh and I still have to figure out how to attach the damn head unit to the Miata tombstone in a way that looks halfway decent. Might be time to buy a dremal tool. I’m waiting on an oil filter sandwich plate for the oil pressure sender. I do have a drain plug that will take the sensor... But it hangs pretty low so I think it’s better to wait. The coolant temp sensor I’m not 100% sure where to put yet. I did buy this hose splice thingymajig.... But part of mewants to avoid messing with the cooling system until I get a new beefy track radiator, do a coolant reroute, replace all hoses and swap in an aluminum overflow tank. To be determined. Coolant reroute kit. STOCK Miatas will overheat on track due to the terrible cooling design, so this is a must. Get everything flowing properly. There are about five well-tested coolant reroute kits available, and the supermiata one sounds like the superior product. Along with that, a beefier radiator. My Amazon-special koyorad radiator is getting pretty beat anyways, and was literally the cheapest radiator I could find to get the car running when I first bought it. There are two good options for a heavy-duty radiator in high-power applications. The supermiata, and Track Speed Engineering‘s radiator. I’m undecided. The Supermiata radiator is fantastic, lightweight, and has tons of data backing it up as an efficient flowing design. The TSE is a duel core triple pass radiator built for very high boost settings, and is both heavier, and much more expensive. Either one would probably serve me well. TSE is where my turbo kit came from, and supermiata is where I try to get most of my other parts if possible so I have no problem doing business with either.